Government officials say they'll meet a pair of court-ordered deadlines to reunite children with their parents. But doing so, HHS Secretary Alex Azar warned, could mean relaxed standards for vetting those parents. The federal government plans to meet a pair of ambitious court-ordered deadlines for reuniting families separated at the border — even though officials say doing so may mean relaxing government standards in the process of vetting those parents. A federal judge in California told the government last week that all children under the age of 5 who were split from their families at the border must be brought together with their parents by Tuesday. The government has until July 26 to reunite families of older children. But that timeline, Health and Human Services Secretary Alex Azar told reporters Thursday morning, presents a host of challenges — including the risk that the agency will have to compromise its procedures for investigating parents’ backgrounds. Before reuniting families, Azar said, his agency must confirm that “purported parents” do indeed have blood ties to the children they claim and also verify that they are safe caretakers. There are about 100 separated children under 5 in his agency’s custody, Azar said. Azar said that while vetting parents for children under 5, government workers have already come across some parents with “criminal histories that were inconsistent with child safety,” including several forms of abuse. He seemed to warn that more nightmare cases could emerge if the government rushes to meet its looming deadline. To meet the Tuesday deadline, Azar said his agency has deployed an additional 230 federal workers to manually sift through the case files of about 11,800 unaccompanied alien children — most of whom crossed the border alone and less than 3,000 of whom were taken from their parents. Federal officials are also using DNA tests to confirm parentage. Even as the government promises on-time reunifications, workers on the ground and shelters contracted by HHS have indicated that there isn’t a clear plan in place for how — or where — those reunions will take place. Azar said Thursday morning that once children are returned to their parents, the families will be in the custody of a different federal agency: the Department of Homeland Security, which includes Immigrations and Customs Enforcement. 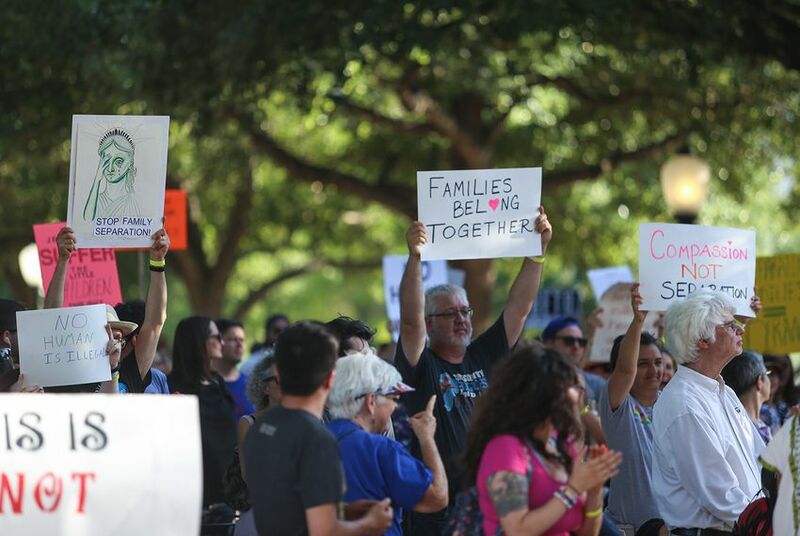 But there are only three ICE detention centers in the country currently equipped to house families, and there are legal challenges to keeping families there indefinitely as their immigration proceedings drag on, including a 20-day restriction on detaining children. A military base at Fort Bliss is expected to serve as a temporary detention center for families, according to the El Paso Times. Azar complained that “conflicting court orders,” like the 20-day limitation, have left the federal government in a difficult spot. Officials at Southwest Key Programs, the government-contracted shelter company that houses more than half of the unaccompanied minors in the country, have said that they’re prepared to reunite nearly all of the children in their care with their parents — but they’re waiting on cues from the government. “We’re ready today,” Juan Sanchez, CEO of Southwest Key, told the Associated Press last month, adding that there seemed to be a lack of urgency on the government’s part. A Southwest Key official said last month that its shelters had kept track of the locations of all the parents of the separated children it housed and allowed families to be in touch via phone to the extent possible. Disclosure: Jeff Eller, a communications adviser to Southwest Key, is a donor and former board member of The Texas Tribune. The Tribune is a nonprofit, nonpartisan news organization that is funded in part by donations from members, foundations and corporate sponsors. Financial supporters play no role in the Tribune's journalism. View a complete list.